These custom burlap home goods are made from jute fibers. Grown predominantly from India and Bangladesh, burlap is one of the world's most affordable and sustainable natural materials, and is often reused or recycled. 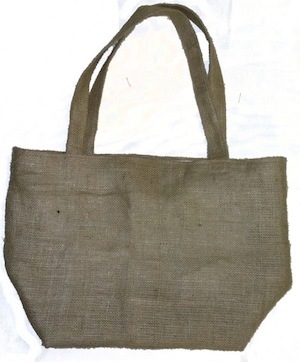 Some custom burlap home goods we've produced include tote bags, wall decor, placemats, and many others. Burlap is also an excellent material for curtains, silverware holders, pillows, canvases, tablecloths, and storage. At Commercial Bag and Supply we're able to complete a wide selection of custom orders since all of our products are made in the USA. We're able to tackle any project, no matter the size or quantity.